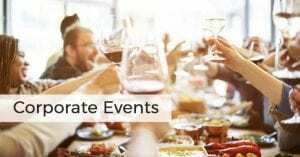 If you’re in charge of planning a company or organization’s corporate event, you want to make it memorable and successful without breaking your budget. Whether you’re entertaining clients, rewarding employees for a job well done or looking for an interesting venue for a standard business meeting, Skyline Cruises has what you need. We have expertise in handling all types of events from weddings and anniversaries to bar and bat mitzvahs and school events. We’ve also done countless corporate events and we can make your event come off the way you envision it. That’s why we want to give you 5 reasons why you should plan a Skyline Cruise for your next corporate event. Holding corporate events can help your organization build recognition for their brand, generate revenues or fundraise and help your employees make connections and just have fun, according to the blog, localist. It’s important to choose a venue that accommodates all of the goals you have for your event. Our luxury yacht, the Skyline Princess has what it takes to fit your needs. It is climate controlled, so it sails in all types of weather, even in winter. The ship is 120-feet long and 31-feet wide. We have three decks which gives you the option of having a meal served on one deck while using other decks for entertainment or presentations. Please note, that we’re expecting renovations to be done at our home port located at the World’s Fair Marina in Queens during the first quarter of 2017. Please check with Skyline for more information and the location of your departure. You want your employees, clients, and guests well fed at your event and Skyline Cruises has many ways to do that. Our in-house chef can handle anything from a small cocktail party to a full-fledged formal event. We serve all types of food and we offer several different packages depending on your needs and your budget. You’ll be served by our professional staff and our event planners will help you put together the perfect menu for your guests. Skyline Cruises has been in business for more than two decades. We started out in 1993 and our management team has over 70 years of yacht charter combined experience, while our sales and operations staff has a combined 60 years of experience in event planning. Skyline is a leader in the industry and there are very few types of events we haven’t planned. We are an owner operated company so you’ll be working directly with the people providing the services at your event and Skyline has an A-plus rating with the Better Business Bureau. We handle all types of corporate events on a Skyline cruise. We’re the perfect venue for a sales meeting or a retirement party. If you want to show your guests a good time, we can provide a dance floor and a DJ. We also have bar space on all three levels of our ship. We have 4,250 square feet of space and we sail at all different times of the day. If you’re affiliated with a not for profit organization, Skyline has hosted all types of fundraisers. Whether it’s a school, church group or charity we’re the ideal venue for fundraisers, dinners or auctions. The unique part of planning your corporate event with Skyline Cruises is that you’ll have some of the world’s most iconic sights as your backdrop. You’ll cruise past some of Manhattan’s most famous buildings including the Empire State Building, Chrysler Building, the UN and the Freedom Tower. Skyline will pass under five New York City Bridges, The RFK-Triborough Bridge, the Ed-Koch Queensborough Bridge and the Williamsburg, Manhattan and Brooklyn Bridges which all connect Manhattan and Brooklyn. The trip is capped off with a breathtaking close-up look at the Statue of Liberty and New York Harbor. We’ll provide the memorable views and assist in planning a corporate event that will help your organization reach its goals. To get started, contact Skyline Cruises today.